(CBS/AP) - CBS News legend Mike Wallace, the "60 Minutes" pit-bull reporter whose probing, brazen style made his name synonymous with the tough interview, died last night. He was 93 and passed peacefully surrounded by family members at Waveny Care Center in New Canaan, Conn., where he spent the past few years. "All of us at CBS News and particularly at '60 Minutes' owe so much to Mike. Without him and his iconic style, there probably wouldn't be a '60 Minutes,' said Jeff Fager, chairman CBS News and executive producer of "60 Minutes." As the journalism world reacted to the iconic newsman's passing, the AP's David Bauder noted the "60 Minutes" journalist's reputation as a pitiless inquisitor was so fearsome that the words "Mike Wallace is here to see you" were the most dreaded words in the English language; capable of reducing an interview subject to a shaking, sweating mess. "Wallace didn't just interview people," wrote Bauder on Sunday. "He interrogated them. He cross-examined them. Sometimes he eviscerated them. His weapons were many: thorough research, a cocked eyebrow, a skeptical "Come on" and a question so direct sometimes it took your breath away." "He loved it," Fager said Sunday. "He loved that part of Mike Wallace. He loved being Mike Wallace. He loved the fact that if he showed up for an interview, it made people nervous. ... He knew, and he knew that everybody else knew, that he was going to get to the truth. And that's what motivated him." "It is with tremendous sadness that we mark the passing of Mike Wallace. His extraordinary contribution as a broadcaster is immeasurable and he has been a force within the television industry throughout its existence. His loss will be felt by all of us at CBS," said Leslie Moonves, president and CEO, CBS Corporation. Wallace made "60 Minutes" compulsively watchable, television's first newsmagazine that became appointment viewing on Sunday nights. His last interview, in January 2008, was with Roger Clemens on his alleged steroid use. Slowed by a triple bypass later that month and the ravages of time, he retired from public life. During the Iranian hostage crisis in 1979, he asked Iran's Ayatollah Khomeini  then a feared figure  what he thought about being called "a lunatic" by Egyptian President Anwar Sadat. Khomeini answered by predicting Sadat's assassination. Wallace played a huge role in "60 Minutes"' rise to the top of the ratings to become the number-one program of all time, with an unprecedented 23 seasons on the Nielsen annual top 10 list - five as the number-one program. He announced he would step down to become a "correspondent emeritus" in the spring of 2006, but Wallace continued to land big interviews for "60 Minutes." His last appearance on television, on January 6, 2008, was a sit-down on "60 Minutes" with accused steroid user Roger Clemens that made front-page news. His August 2006 interview of Iranian President Mahmoud Ahmadinejad won him his 21st Emmy at the age of 89. He was also granted the first post-prison interview with assisted suicide advocate and convicted killer Dr. Jack Kevorkian for a June 2007 "60 Minutes" broadcast. After a successful triple bypass operation in late January 2008, he retired from public life. Decades before his "60 Minutes" success, Wallace was already known to millions. In the early days of broadcasting, with no line between news and entertainment, Wallace did both. In the 1940s and '50s, he appeared on a variety of radio and television programs, first as narrator/announcer, then as a reporter, actor and program host. On his first network television news program, ABC's "The Mike Wallace Interview," he perfected his interviewing style that he first tried on a local New York television guest show called "Night Beat." Created with producer Ted Yates, "Night Beat" became an instant hit that New Yorkers began referring to as "brow beat." Wallace's relentless questioning of his subjects proved to be a compelling alternative to the polite chit-chat practiced by early television hosts. Years later, CBS News producer Don Hewitt remembered that hard-charging style when creating his pioneering news magazine, "60 Minutes"; he picked Wallace to be a counterweight to the avuncular Harry Reasoner. On September 24, 1968, Wallace and Reasoner introduced "60 Minutes" to the 10:00 p.m. timeslot, where it ran every other Tuesday. It failed to draw large audiences. But critics praised it, awards followed, and after seven years on various nights, "60 Minutes" went to 7:00 p.m. Sunday and began its rise. It made the top 20 in 1977 and the top 10 in 1978, then became the number-one program in 1980 - all with a tough-talking Wallace center stage. 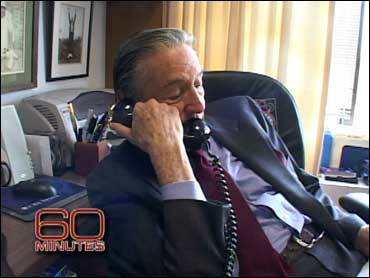 The rising interest in Wallace and "60 Minutes" grew partly out of the Watergate scandal. Wallace's interrogations of John Erlichman, G. Gordon Liddy and H.R. Haldeman whetted the appetites of news junkies who continued to tune in to see Wallace joust with other scoundrels. Before long, he was a household name. In 1983, Coors beer took ads out in major newspapers after Wallace's "60 Minutes" investigation found little truth to rumors the company was racist. "The Four Most Dreaded Words in the English Language: Mike Wallace is Here," ran atop ads boasting that the firm had passed muster with the "grand inquisitor" himself. Each week, "60 Minutes" viewers could expect the master interviewer to ask the questions they wanted answered by the world's leaders and headliners. Wallace did not disappoint them, often revealing more than the public ever hoped to see. He got the stoic Ayatollah Khomeini to smile during the Iranian hostage crisis in 1979 when he asked him what he thought about being called "a lunatic" by Egyptian President Anwar Sadat. The Ayatollah answered by correctly predicting that Sadat would be assassinated. The same year, Johnny Carson called Wallace "cruel" during an interview after Wallace asked, "It takes one to know one?" when the late-night star took pity on an alcoholic newsmaker. Her fans protested when Wallace brought Barbra Streisand to the emotional edge in 1991 by revealing that her own mother had told him that Barbara "was too busy to get close to anyone." Wallace was also known for pioneering the "ambush" interview, presenting his unsuspecting interviewee with evidence of malfeasance - often obtained by hidden camera - then capturing the stunned reaction. Two of the more famous exposes in this genre that used hidden cameras were investigations of a phony cancer clinic and a laboratory offering Medicaid kickbacks to doctors. Presenting interviewees with their own misdeeds became a "60 Minutes" staple, but the hidden camera and ambush were later shunned as they were widely imitated, and even Wallace admitted their use was to "create heat, rather than light." Mike Wallace's landmark 1998 interview with the man known as "Dr. Death"
No story generated more controversy than Wallace's 1998 interview with euthanasia practitioner Dr. Jack Kevorkian. Wallace and "60 Minutes" took heat for broadcasting Kevorkian's own tape showing him lethally injecting a man suffering from amyotrophic lateral sclerosis. The death of Thomas Youk broadcast on "60 Minutes" made headlines and the editorial pages, generating discussion about euthanasia for weeks. The tape also served as evidence to convict Kevorkian of murder. In another controversy, Wallace's 1995 interview of Jeffrey Wigand, the highest-ranking tobacco executive to turn whistle-blower, was held back for fear of a multi-billion dollar lawsuit that could have bankrupted CBS. The interview, in which Wigand revealed tobacco executives knew and covered up the fact that tobacco caused disease, was eventually broadcast on "60 Minutes" in February 1996. The incident became the subject of the film, "The Insider" (in which Wallace was played by Christopher Plummer). The grueling test became a defining moment in Wallace's life. Medication and therapy helped him overcome his initial depression and a later relapse, and he became a heroic example to fellow sufferers, speaking publicly for the rest of his life to de-stigmatize the disorder. He revealed years later to colleague Morley Safer in a "60 Minutes" special on his life that he had attempted suicide during the lawsuit crisis. In another celebrated case that took 12 years to play out, Wallace's producer Barry Lando was sued for $44 million by Lt. Col. Anthony Herbert. The libel suit against Wallace's 1973 "60 Minutes" report, "The Selling of Colonel Herbert," caused a precedent-setting Supreme Court ruling allowing lawyers to question the thoughts and opinions of reporters. Initially, CBS lawyers argued successfully in a New York federal appeals court that Lando could not be questioned that way as it would infringe on the editorial process protected under the First Amendment. But the Supreme Court in 1979 reversed it, ruling that Herbert was entitled to know the producer's mindset, as it was crucial to proving malice. Nevertheless, the report was accurate in its main elements, and, in 1986, Herbert v. Lando was thrown out. The road to "60 Minutes" began for Wallace when his son, Peter, died in a hiking accident in Greece in 1962. Wallace's jobs in broadcasting then included entertainment programs and commercials in addition to reporting, but he decided then that he would devote his career to journalism alone to honor Peter, a Yale student who aspired to a writing career. Wallace's other son, Chris, became a journalist and is currently host of "Fox News Sunday." Myron Leon Wallace was born in Brookline, Mass., on May 9, 1918. He attended Brookline High School and was graduated from the University of Michigan in 1939 with a B.A. degree in liberal arts. He became acquainted with radio at the college station and, after graduation, a professor helped him land his first job as an announcer and "rip-and-read" reporter for WOOD-WASH, a Grand Rapids, Mich. radio station. Wallace authored several books, including: "Mike Wallace Asks," a compilation of interviews from "Night Beat" and "The Mike Wallace Interview" published in 1958; his memoir, "Close Encounter," co-authored with Gary Paul Gates, in 1984; and "Between You and Me," also with Gates, in 2005. Besides his 21 Emmy Awards, Wallace was the recipient of five DuPont-Columbia journalism and five Peabody Awards, and was the Paul White Award winner in 1991, the highest honor given by the Radio and Television News Directors Association. He won the Robert F. Kennedy Journalism Award grand prize and television first prize in 1996. In June of 1991, he was inducted into the Television Academy Hall of Fame. Wallace is survived by his wife, the former Mary Yates; his son, Chris; a stepdaughter, Pauline Dora; two stepsons, Eames and Angus Yates; seven grandchildren; and four great-grandchildren. At the family's request, donations can be made in Wallace's name to Waveny Care Center, 3 Farm Rd., New Canaan, Conn.